"Delight your family tonight with this scrumptious dessert from Kraft." Mix apples, sugar, tapioca, cinnamon and nutmeg in large bowl. Let stand 15 minutes. 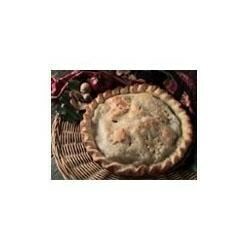 Prepare pie crusts as directed on package for two-crust pie, using 9-inch pie plate. Fill with fruit mixture. Dot with butter. Cover with second pie crust; seal and flute edge. Cut several slits to permit steam to escape. © KF Holdings. Used with permission.